General Notes on the overall Tahoe to Yosemite Trip. Planning, Resupply plan, route notes. Specific Trail issues can be addressed in the TYT Trail Guide. Above: Rock Wall on ridge descending East from Phipps Pass, Desolation Wilderness. Our trail guide concentrates its attention on the main TYT-PCT route across Desolation Wilderness. This Forum covers hiker input about Desolation Wilderness trails not yet on the trail guide, or not connected with the route of the TYT-PCT across Desolation. Meeks Bay Trailhead is the startpoint for the Tahoe to Yosemite Trail. 11.5 miles Southwest of Meeks Bay the Tahoe to Yosemite Trail intersects with the Pacific Crest Trail for the remaining 19.21 South across Desolation Wilderness to the Echo Summit trailhead. Post up your favorite Trails and Trailheads accessing the Sierra Crest North of Desolation Wilderness through Granite Chief Wilderness up to where the PCT passes out of the Tahoe Basin through Donner Summit on Highway 80. Above: View of South Lake Tahoe from Meiss Country Roadless Area. Though the Trail Guide and Forum well covers the Meiss Country Roadless Area, there are backpacking trips in from Strawberry, Schineders Camp, and Big Meadow that are not covered in the trail guide and forum. You experiences and impressions on any trails and trips you've hiked in the Meiss Roadless Area are welcome here. Echo Summit is the middle Lake Tahoe traihead option for backpackers hiking Lake Tahoe to Mount Whitney. Located South of Meeks Bay and Desolation Wilderness, sitting on the edge of the Tahoe Rim, Echo Summit also offers easy local backpacking access South into the Meiss Roadless Area, a special zone in the LTBMU. There are numerous potential short and medium distance trailhead to trailhead trips and one good loop launchable from Echo Summit, if you are not pointing it far to the South. Your trip reports, experiences, and observations will inform others far into the future. The South Upper Truckee trailhead in Meyers is the Southernmost trailhead for Long Distance backpackers heading to Mount Whitney from the Lake Tahoe Basin. A 5.51 mile climb brings us to Meiss Cabin, where we find our junction with the combined Pacific Crest and Tahoe to Yosemite Trail routes in the Southwest corner of the Lake Tahoe Basin. above: New sign, new trailhead configuration, and new route for lower section of the South Upper Truckee trail finished in '08. The following forum topic, below, covers the Tahoe to Yosemite Trail across the Western side of the Mokelumne Wilderness in the El Dorado National Forest. Click it to see the trails between Round Top and Lake Alpine. Yet there are more trails and trips than those of the Tahoe to Yosemite route depicted on the trail guide, and the forum below. This forum is for those backpacking trails and backpacking trips. This Mokelumne Wilderness Forum is for those other backpacking trips and trails off of the Tahoe to Yosemite Trail route, that are not depicted in the trail guide and forum below. Notes and Facts about the Tahoe to Yosemite route between the Carson Gap above Highway 88 to Lake Alpine on Highway 4. Post your experiences, comments, and questions here. Review the evolution of trail-route conditions over the last few years, and add your trail report to keep us up to date. Above: The TYT breaks off from the PCT towards Round Top and The Sisters. Looking South at the Tahoe Yosemite route around SW of Round Top across the 1st Southbound trail junction to the TY Trail off the PCT, from the Carson Gap. The Carson Pass sits 1.4 miles to the SE along the PCT. The Tahoe to Yosemite Trail splits off from the Pacific Crest Trail at the Carson Gap to cross onto the Western Flank of the Sierras heading to Lake Alpine. This section of the TYT features a very challenging seven mile segment of unmaintained trail from Summit City Creek to Camp Irene along Summit City Creek and the N Mokelumne River. Carson Pass Region: The two trails. Hiker reports updating Tahoe to Yosemite Trail Conditions. Don't bypass the 2013 reports. We had some wise, observant hikers reporting on the trail in 2013 who reported features I have not seen before. Read all the trail updates to be as informed as possible. Post up your experiences. Each individual hiker has different experiences hiking exactly the same route. This is especially true on unmaintained routes such as this. We may end up taking a different route than most others. It is here in the annual trip reports that you will find the range of experiences necessary to cover your potential range of experiences. Hiker reports and experiences on the unmaintained segments of the TYT in Mokelumne and Carson Iceberg Wilderness. Make sure we review the other year's reports, above, as all contain valuable information about the evolution of trail conditions, and each reports on conditions you may expect to encounter. Also check out the reports on the unmaintained route over Saint Marys Pass via the Clarks Fork. Exiting the Tahoe Basin through the Carson Gap offers Tahoe to Yosemite hikers three routes to Round Top Lake. The following forum topic, below, covers the Tahoe to Yosemite Trail across the Western side of the Carson Iceberg Wilderness in the Stanislaus National Forest. Click the Forum Topics below this one to see the Tahoe to Yosemite Trail between Lake Alpine and Saint Marys Pass. Yet there are more trails and trips than those of the Tahoe to Yosemite route depicted on the trail guide, and on the forum below. This forum is for those backpacking trails and backpacking trips. This Carson Iceberg Wilderness Forum is for those other backpacking trips and trails off of the Tahoe to Yosemite Trail route that are not depicted in the trail guide and forum below. Crossing Highway 4 on the East side of Lake Alpine marks our entry into the Carson-Iceberg Wilderness through the Silver Valley Trailhead. Highway 4 offers opportunities to rest, resupply, and feed up at the Lake Alpine Lodge, Bear Valley, or Arnold. On the Southern end of the Carson-Iceberg we will pass through Kennedy Meadows, where we can also resupply. Hiker reports updating unmaintained and no-trail Conditions along the Tahoe to Yosemite Trail through the Headwaters of the Clarks Fork of the Stanislaus River, and find our way out of its sheer headwaters bowl. Other hiker's historic experiences here will inform your future hikes. Above: Summit Creek sunrise climbing to Sheep Camp, backpacking Emigrant Wilderness on the Tahoe to Yosemite Trail. The trail guide and Forum follow the Tahoe to Yosemite and Pacific Crest Trail routes across the Emigrant Wilderness. This forum is for other routes not along the TYT or PCT. Tahoe to Yosemite Trail South from Kennedy Meadows through Emigrant Wilderness to join PCT in Yosemite. Click red dots on maps for information on that particular location. Above: Upper bridge following Tahoe to Yosemite Trail South up Summit Creek to Relief Reservoir, Emigrant Wilderness. Stunning 4 miles of stiff intermediate difficulty trail up great granite gorge to campsites on East side of Relief Reservoir. Click red dots and arrows to adajacent maps for information on that particular location and the next maps along the trail. 8 miles up Summit Creek through stunning terrain and campsites of Saucer Meadow, Sheep Camp, and Lunch Meadow. Click red dots for specific trail information, labels and arrows for adjacent maps. Above: Emigrant Meadow, Grizzly Peak, Grizzly Meadow, Tower Peak, and Yosemite across Emigrant Wilderness from Brown Bear Pass on a crisp, clear Spring day. High Emigrant Basin trails radiate in all directions. We hike South towards Tuolumne in Yosemite. Click the red dots for specific trail information, the arrows and labels for adjacent maps. The Southbound TYT and PCT share the same trail across Desolation Wilderness and the Meiss Country Roadless Area in the Tahoe Basin. Departing the Tahoe Basin they split at Carson Pass with the PCT crossing the Eastern edge of the Mokelumne Wilderness while the TYT crosses its Western Flank. This East-West split continues across the Carson Iceberg and Emigrant Wilderness to where the trails rejoin in the Northwest corner of Yosemite National Park. The forum topic below covers the Pacific Crest Trail across the Mokelumne Wilderness South of Carson Pass through the Toiyabe National Forest on the East flank of the Sierra Nevada. There are more trails and trips than the Pacific Crest Trail route depicted on the trail guide, and on the forum below. This forum is to mention those backpacking trails and backpacking trips not depicted on the guide, and for backpackers to post their experiences, suggestions, and updates on the Eastern Mokelumne Wilderness. This East Mokelumne Wilderness Forum is for those other backpacking trips and trails off of the Pacific Crest Trail route that are not depicted in the trail guide and forum below. Notes and Facts about the Pacific Crest Trail route between Carson Pass and Ebbetts Pass. Post your experiences, comments, and questions here. Approaching the Carson Pass Cabin, parking lot, and historical monument while Southbound on the Pacific Crest Trail. This section of the Pacific Crest Trail features a series of unique terrains. This route follows the Eastern Flank of the Sierra Crest. South of Carson Pass. Crossing the exposed Forestdale Divide brings you into thin forests and a beautiful series of lakes stretching South from Blue Lakes to Wet Meadows Reservoir. Further South you traverse miles of eerie volcanic terrain along the exposed Eastern flanks of Raymond and Reynolds Peaks. South of Reynolds you enter a densely forested zone holding Upper and Lower Kinney Lakes. It is a short walk through a rare section of exposed granite from the Kinney Lakes to Ebbetts Pass. Route Discussion: PCT or TY trail to Highway 4? The following forum topic, below, covers the Pacific Crest Trail across the Eastern side of the Carson Iceberg Wilderness in the Stanislaus National Forest. 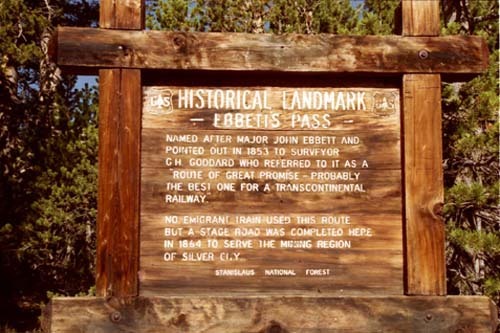 Click it to see the trails between Ebbetts Pass and Sonora Pass. Yet there are many more trails and trips than those of the Pacific Crest Trail route depicted on the trail guide, and the forum below. This forum is for those backpacking trails and backpacking trips. This Carson Iceberg Wilderness Forum is for those other backpacking trips and trails off of the Pacific Crest Trail route that are not depicted in the trail guide and forum below. Ebbetts Pass marks the beginning of our hike across the Carson-Iceberg Wilderness on the Pacific Crest Trail. We can resupply and feed up 15 miles West down Highway 4 at the Lake Alpine Lodge. Click the black dots on the map for detailed map. Click the red dots for specific information on that particular location. From Arnold to the Markleyville/Monitor Split the historical Ebbetts Pass Corridor hosts contemporary social activities as well as backpacking. Arts, Events, Activities and Planning information for the Ebbetts Pass Corridor. Post up about backpacking East of the Sierra Crestline in the watershed of the West Walker River in the slot of terrain between the Hoover and Emigrant Wilderness out of Leavitt Meadow Trailhead. Longest and hardest Pacific Crest Trail section between Tahoe and Whitney. Above: Piute Peak above unique basin at Seavy Pass in the North Yosemite Backcountry. Click the red dots for specific location information, click the arrows and labels for adjacent maps. Above: Leavitt, Koenig, and Latopie Lake nestled into the Southeast flank of Leavitt Peak in the Toiyabe National Forest. Pacific Crest Trail between Latopie Lake and Sonora Pass on Leavitt Peak. Click the red dots on the map for the trail guide, the labels and arrows for adjacent maps. Above: Looking East at PCT route through Kennedy Canyon towards the West West Walker River. Pacific Crest Trail from Latopie Lake to Kennedy Canyon trail junction across Leavitt Peak. Click red dots on maps to see that location. Click labels and arrows for the next map. Above: Tower Peak appears on the Sierra Crestline as we hike to Dorothy Lake Pass. Click the red dots on the map to see that specific location. Above: Emigrant Meadow Lake in Emigrant Meadow from Big Sam in the Emigrant Wilderness. Hiking South over Big Sam to intersect with the TYT at Grizzly Peak from the Kennedy Canyon trail junction for the hike through Bond Pass into the North Yosemite Backcountry is the Third Way across the high elevation section of the Emigrant Wilderness. Trail Guide: Kennedy Canyon on the PCT to Grizzly Peak on the TYT via Big Sam. Click the red dots on the map routes to check out that location on the trail guide. Backpacking the classic combined Pacific Crest & Tahoe to Yosemite Trail route from Jack Main Canyon to Tuolumne Meadows. This forum is for the many other backpacking trails and trips you can take through this divine terrain. Twin Lakes, the Grand Canyon of the Tuolumne, and Hetch Hetchy are a few of the entrances to the North Yosemite Backcountry we will cover here. Above: Jack Main Canyon viewed from above Bond Pass looking at Grace Meadow and Chittenden Peak. Click the red dots on the map for trail guide information for that location. Above: Chittenden Peak beyond Falls Creek in Grace Meadow, Jack Main Canyon, North Yosemite Backcountry. Unified PCT and TYT down Jack Main Canyon to TYT loop around Tilden Lake and PCT route around Wilmer Lake. Click red dots on map for a look at that location on the trail guide. Above: Tower Peak across Tilden Lake along the TYT route. Click red dots along trail route for specific information on that location. Above: Last look at Wilmer Lake climbing South along the Pacific Crest Trail across North Backcountry of Yosemite National Park. Click red dots on marked trail route for location details. We can break off the combined routes of the TYT-PCT to continue 17.9 miles down into Lower Jack Main Canyon to Hetch Hetchy Trailhead in the Grand Canyon of the Tuolumne River. Pacific Crest and Tahoe to Yosemite Trail share this route over the ridge from Stubblefield Canyon to the Rancheria Creek through Kerrick Canyon. Where the canyon turns North we turn South to cross Seavy Pass. Access a Circle Route to Bensen Lake across Three of the Five Canyons of the North Yosemite Backcountry out of the Northeast to & from Twin Lakes on the Bensen-Twin Lakes Loop. Twin Lakes Loop Trail up Kerrick Canyon to Twin Lakes from our entrance to the most remarkable Seavy Pass Bowl. Unified Pacific Crest and Tahoe to Yosemite Trails visit Bensen Lake along this difficult but beautiful segment of trail. Climb over Bensen Pass and follow Wilson Creek down to Matterhorn Canyon. Ford Matterhorn Creek for big climb to Miller Lake. Pleasures of Glen Aulin short distance from the pleasures and resupply at Tuolumne Meadows. Off the Sierra Crest down the JMT to Yosemite Valley. The JMT and PCT share the majority of the route South from Yosemite to the turn for Mount Whitney. Southbound from Tuolumne Meadows on the JMT-PCT into Ansel Adams Wilderness. A short but beautiful length of the John Muir Trail between resupply spots. Another short section of trail between resupply spots, so take this time to feed up. The next section from Muir Ranch to Muir Portal will test your capacities. The long and hard end to our Tahoe to Whitney backpacking trip. The Whitney Portal is the end of the Tahoe to Whitney Trail, the end of the John Muir Trail, and the beginning of great local backpacking and day hikes to the Crest of Mount Whitney and back. Lake Tahoe to Mount Whitney miles and elevations for backpackers and hikers. Notes on miles and elevations hiking High Sierra Nevada trails. Miles and Elevations on the trails from Tuolumne Meadows to Reds Meadow.